Can be used before workouts, after workouts, or prior to bedtime. Individual nutritional requirements vary depending on gender, body weight, level of activity and exercise/training intensity. Ingredients: Cocoa powder (processed with alkali), sunflower lecithin, tricalcium phosphate, carrageenan, xanthan gum, natural flavors. Ingredients: Tricalcium phosphate, sunflower lecithin, cellulose gum, carrageenan, xanthan gum, natural flavors. Ingredients: Tricalcium phosphate, sunflower lecithin, xanthan gum, carrageenan, natural flavors, red beet powder (natural color). Ingredients: Tricalcium phosphate, sunflower lecithin, xanthan gum, carrageenan, natural flavors, beta carotene powder (natural color). Ingredients: Tricalcium phosphate, sunflower lecithin, xanthan gum, carrageenan, natural flavors, red beet powder (natural color), beta carotene powder (natural color). 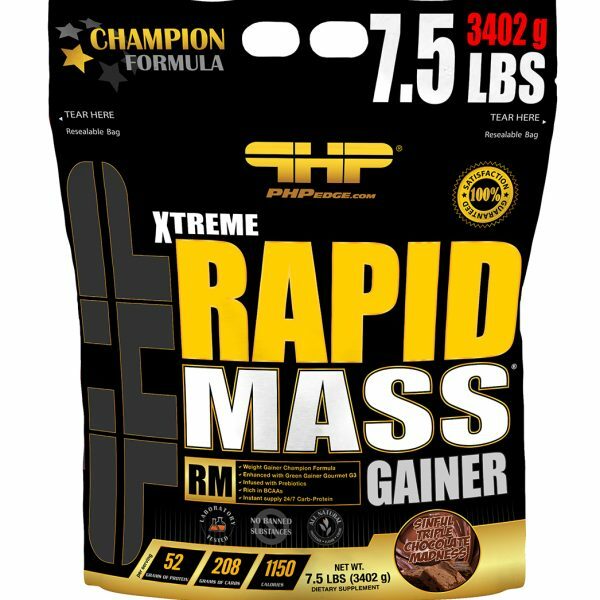 SUGGESTED USE: For Optimum Mass gain use the Xtreme RAPID MASS ™ twice a day for an 8-week period. Mix 5 scoops of powder with 32 oz (946 ml) of water or your favorite beverage. Stir and enjoy! CAUTION: Not recommended to children and pregnant or breastfeeding women. Consult a health care practitioner prior to use if you have a liver or kidney disorder. May result in weight gain. Not to be used as the only source of nutrition. This product is packed by weight and not by volume. KEEP OUT OF REACH OF CHILDREN. Store in a cool dry place. Do not use if the security seal is broken. ALLERGEN INFORMATION: Contains ingredients derived from milk. This product is manufactured in a facility that processes milk, soy, and eggs.